Blue Creek forms one of the larger drainages of the Chisos Mountains in the center of Big Bend National Park, starting in the wooded slopes south of Emory Peak and flowing westwards through a fairly shallow, V-shaped canyon, reaching the desert lowlands after 4 miles, as the land drops by 2,000 feet. A 5.5 mile trail runs all along the valley floor, starting along Ross Maxwell Scenic Drive and linking with the Laguna Meadows Trail high in the mountains. Although not many people walk the full distance, the lower 1.5 miles is a good short hike, first passing an old cabin, relic of ranching operations early in the 20th century prior to the national park creation, and secondly a series of striking rock formations, where outcrops of layered sandstone have eroded into spires, ridges and hoodoos, colored deep red - scenery reminiscent of places in far away Utah. 7 views along the Blue Creek Canyon Trail. 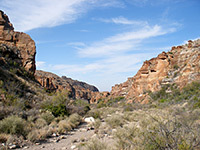 The Blue Creek Canyon trailhead is on the east side of the road as it runs along a ridge between two valleys, a point 8 miles south of the junction with Hwy 118, and close to Sotol Vista Overlook. 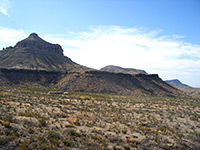 From the rim, the land slopes down 120 feet to the wide, overgrown floor of the canyon, an area once used for cattle grazing by local landowner Homer Wilson. 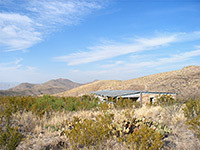 The old ranch building is situated beside the canyon wash, and reached by a 0.3 mile walk along the trail, which descends the cliffs and crosses the bushy flats. The house has a relatively recent appearance, sturdily constructed of wood, stones and concrete, and is in a good state of preservation. 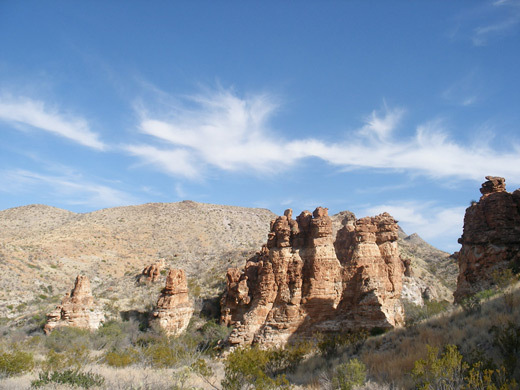 The path splits here; one branch (Dodson Trail) heads south and intersects with several other routes across the desert wilderness south of the Chisos Mountains. The other path heads directly up Blue Creek Canyon, either right along the wash, where walking is a little tiring owing to loose pebbles, or on firmer ground on the north side, and is well used, marked with cairns. The rocks are visible from the cabin and reached after about a mile - weathered cliffs and ridges lining both edges of the canyon, eroded into hoodoos and pinnacles. The sandstone has a rich red-brown color, more appealing that most rocks in the Big Bend area which tend to be dull and faded. The path gains height slowly but steadily, curving round a few bends until the rocky outcrops fade away, replaced by steep, grassy slopes. Vegetation in this part of the valley is a mixture of bushes and cacti, reflecting the moderate elevation of 4,500 feet - an environment still very hot in summer, though conditions are rather cooler further upcanyon, where tall trees grow.